Excel is great for managing data. But if you want to find powerful insights from your data, Excel can’t do the job on its own - it needs the power of visual analytics. 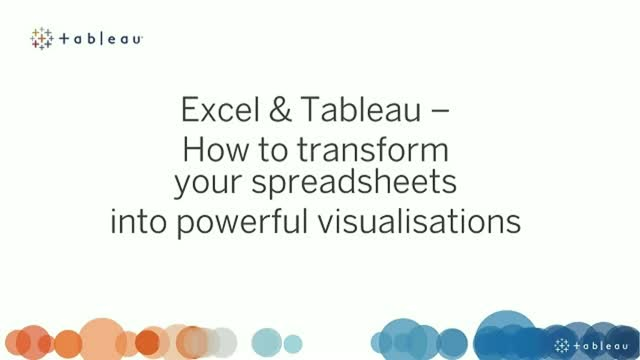 In this live webinar, we’re going to reveal how you can discover a wealth of new insights by using Excel and Tableau together. As Tableau natively connects to Excel, you can keep your spreadsheets whilst digging deeper into your data with fast and easy drag-and-drop analytics. When moving from a Traditional to a Modern Business Intelligence platform, giving business users access to data whilst maintaining data governance may seem like an either/or choice. With Tableau, it's not. In this webinar, discover the most important details that IT must consider when evaluating and selecting a modern analytics platform. When you are trying to understand and find key insights from your data, where do you begin? There are two popular approaches to visual data exploration-data visualisation and visual analytics. Both methods can help you to better understand your data, and this webinar will show you why. As data privacy has risen in prominence, consumers are more cautious than ever about sharing data. This, in turn, affects how businesses approach data monetization, collection, and sharing. And with new regulations like GDPR, organizations are faced with crucial questions around data ethics and privacy in the context of their day-to-day business practices. Attend this live webinar where we’ll delve into these 3 key areas: data ethics, data privacy, and management and processes around data. As data privacy has risen in prominence, consumers are more cautious than ever about sharing data. This, in turn, affects how businesses approach data monetisation, collection, and sharing. And with new regulations like GDPR, organisations are faced with crucial questions around data ethics and privacy in the context of their day-to-day business practices. The promise of artificial intelligence (AI) is that machines will help humans make better decisions. In some cases decisions are automated away; in other cases humans collaborate with AI to make the best decisions. In all cases, people need to understand what machines are doing, to avoid mistakes, to make ethical decisions, and to understand their data. Gartner research indicates “85% of CIOs will be piloting artificial intelligence programs through a combination of buy, build, and outsource efforts.” But as organisations become more reliant on AI and machine learning models, how can humans be sure they are receiving trustworthy answers to the right questions? Attend this webinar to hear directly from the developers at Tableau who lead our investments in AI and learn about our plans to partner with AWS. Keeping up with the rapid pace of change in the BI ecosystem gets more challenging every year. To identify the 10 most influential BI trends for 2019 we interviewed a variety of customers, Tableau staff, and data experts. *The rise of explainable AI. *Natural language humanises your data. *Actionable analytics put data in context. *Data collaborative's amplify social good impact. *Codes of ethics catch up to data. *Data management converges with modern BI platforms. *Data storytelling is the new language of corporations. *Enterprises get smarter about analytics adoption. *Data democracy elevates the data scientist. *Accelerated cloud data migration fuels modern BI adoption. Watch this webinar to hear directly from the engineering team at Tableau who lead our investments in AI and learn about our plans to partner with AWS. Tableau does more than produce beautiful visualisations. See for yourself how Tableau takes you on a journey of data exploration to help you find insights that you never expected. You'll hear from three leading data experts about their process for visually exploring data, helping you to choose the best visualisations that unlock new questions and answers of your data. Keeping up with the rapid pace of change in the Business Intelligence ecosystem gets more challenging every year. We interviewed a variety of customers, Tableau staff, and experts to identify 10 influential Business Intelligence trends. This 60-minute webinar will give you a high-level overview of all 10 trends including artificial intelligence (AI), natural language processing (NLP), data ethics, and more. This webinar explores the evolution of self-service BI and the rise of smart analytics in the market, examining four key areas in which Tableau continues to invest: data prep, data analysis and discovery, natural language interactions, and predictive analytics - with Constellation Research Principal Analyst, Doug Henschen. Doug will also be joined by several members of the Tableau development team to discuss our vision for the future of smart analytics and how Tableau is helping to drive these features forward. In this webinar, we’re going to reveal how you can discover a wealth of new insights by using Excel and Tableau together. As Tableau natively connects to Excel, you can keep your spreadsheets whilst digging deeper into your data with fast and easy drag-and-drop analytics. Learn about the key attribute that makes Tableau so different—you can quickly discover new insights by continually asking and answering questions of your data with ease. You'll see a demo of Tableau in the flow of analysis, before showing you how Tableau makes it easy to visualise and share insights in a way that’s easy to understand for your audience. *What is data visualisation and how can it help you unlock more insights? If you work with data—including Excel—this webinar will teach you about the science behind data visualisation and how to apply it to your real-world analysis. Learn why using visual elements like charts, graphs, and maps, will help you to communicate data in a way that’s easy to understand whilst providing the greatest degree of insight for your audience. Finance teams typically chase down non-compliant activity after the fact in an attempt to minimise the damage. However, with a modern analytics platform like Tableau it's quick and easy to detect potential violations in real-time by visually analysing your own data. In today's data-driven world, organisations are using modern analytics to proactively detect non-compliance. In this webinar, discover how Tableau enables you to quickly monitor key compliance metrics so you can better inform operational decision making. CFO's agree that their finance departments are increasingly being tasked with supporting business strategy. But FP&A teams stuck with legacy systems and processes will struggle to deliver the insights their leadership needs. A recent Deloitte survey of senior finance executives found that cost reduction has become a global imperative, with 86% of global respondents saying their companies are likely to undertake cost reduction initiatives over the next 25 months. Anyone who's ever analyzed data knows the pain of digging in only to find that it is poorly structured, full of inaccuracies, or just plain incomplete. But "dirty data" isn't just a pain point for analysts; it can have a major financial and cultural impact on an organization. Attend this live webinar to learn four actionable ways to overcome common data preparation issues including how to establish a company standard for "clean data" and how to democratize data prep across your organization. Do you want to evolve your marketing analytics strategy so that it's built for long-term success? With new data-rich marketing channels and technologies emerging all the time, marketers must evolve their analytics strategy to make better and faster decisions with data. In this webinar, learn where your own marketing analytics strategy ranks on the analytical spectrum, before discovering the next steps you can take towards superior data-driven marketing. Whether your team is at the beginning of its data journey or further along, you'll discover what people, skills, and data solutions you need to advance your marketing analytics. *Advance your marketing analytics strategy along the analytical spectrum. *Empower your entire team with data and analytics. *Combine data from all of your marketing channels and technologies. *Identify new marketing opportunities and cost-savings. Want to build dashboards that answer all of your marketing questions and are easy to understand? With a mass of data, marketers—especially CMOs—rely on analytics dashboards to get a complete view of their customers, campaigns, and marketing channels. A great dashboard will help you see how much revenue was attributed to paid search, which online channels are generating high quality leads, and what's happening at each stage of the customer journey, plus much more! But how do you build a great marketing dashboard? In this webinar, learn the four key characteristics of a great marketing dashboard so you can generate more insights from your data. *Choose the right marketing metrics for your dashboards. *Make your dashboards easier to understand by leveraging visual best practises. *Maximise the impact of your dashboards by making them easily accessible to the business. *Combine data from multiple marketing channels to get a full picture. When exploring self-service analytics at enterprise scale, governance is likely one of your top considerations. Combining people, process, and technology, the Tableau Governance Framework creates accountability and enables access to secure and trusted data and for all skill levels in your organization. Tableau makes it easy for people to rapidly transform data into smart business analytics. It’s a new kind of business intelligence software – rapid-fire business intelligence. We’ve done years of research to build business analytics software that supports people’s natural ability to think visually. Shift fluidly between interactive views, graphs & reports, following your natural train of thought. You’re not stuck in wizards, bogged down writing scripts or waiting for IT to develop a report. You quickly create useful data visualizations, reports & dashboards. And then in a click, you share them across your organization. All the things you wished you could do with business intelligence —work with huge data live or in-memory, mash up data sources, visualize data in multiple ways, build dashboards, create interactive data applications—are not only possible in Tableau but are also quick work.